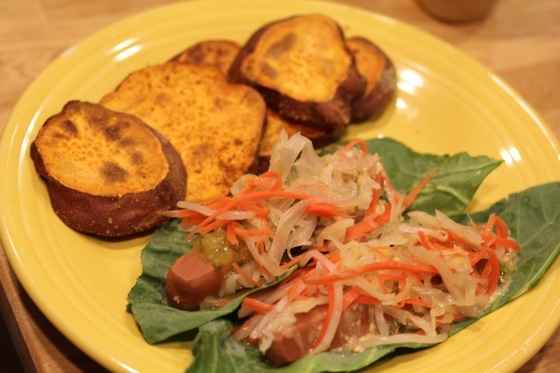 Sweet Potato, Sauerkraut Dog & A Winner! Thursday night dinners should probably be called WTF dinners for me, especially today. I’m usually running low on fresh foods and ideas after a busy week and ending up with crazy concoctions. Tonight was no exception! 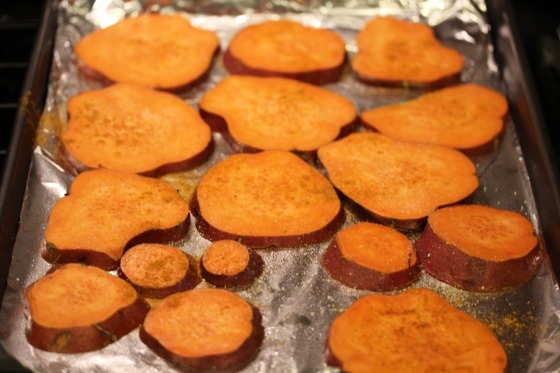 I had a huge sweet potato that needed to be used up and sliced it in 1/2-1/4″ rounds to bake. Then tossed the rounds with coconut oil, salt and a sprinkle of curry. 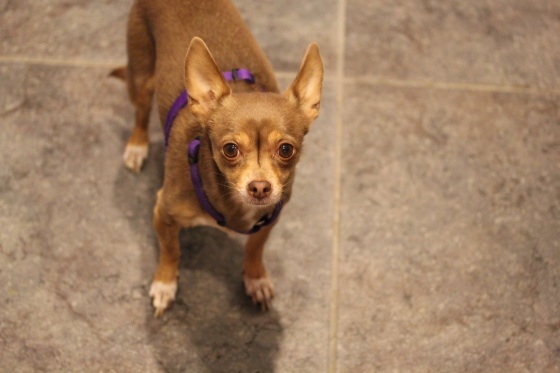 While for some reason my dog was begging at my feet. Don’t be fooled, she already had dinner. I spread the rounds on a baking sheet and sprinkled with more curry and salt and baked for 40 minutes at 400 degrees. While they were baking, I pulled out Yves Vegan Veggie Dogs that I impulse bought at Whole Foods when they were on sale. 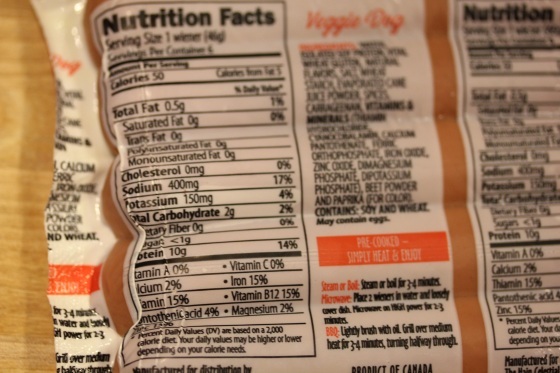 I was attracted to them because of the low-calorie count and high protein, at 50-calories a pop, I didn’t feel bad about having 2. 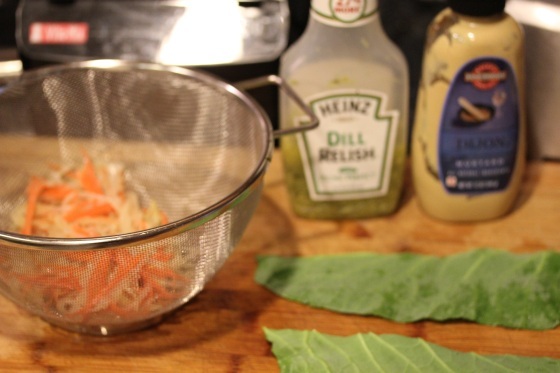 Since I have a huge jar of cultured veggies that I’m working through, I got inspired by this recipe to create my own sauerkraut dog using collard greens as the bun. That wasn’t as easy as I thought since the collard leaves I have are smaller than usual, but I made it work. My crazy dinner actually ended up being pretty good, the texture of the sweet potato rounds was perfect, a little crispy on the outside, but warm and gooey on the inside. The curry flavor wasn’t too strong, but there and complemented the coconut flavor nicely. The Yves dogs were tasty and pretty close to real hot dogs, though it’s been ages since I’ve had one. However, they’re a little salty, good thing my cultured veggies weren’t salted! Congrats Jenna! Check your email and have fun shopping! 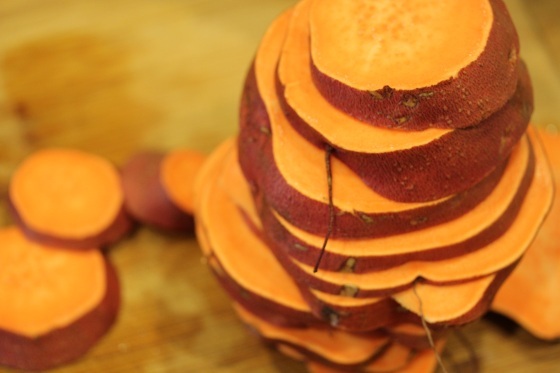 The sweet taters…look awesome! And so did your taters in the last post. And just yeseterday i was talking sweet taters and I still need to get to work roasting some! Been sooooo busy this week. Insane. I am also thinking about getting the clarsonic face thing you have. I trust your opinions on that kind of thing tons…and so I should prob just order it…I have been dropping money left and right this week, but yeah, skin is #1 priority! I hear ya on being busy, crazy week. Nice thing about potato roasting is they’re quick to prepare, then you just through them into oven and forget about them for a bit. I am really liking the Clarisonic, it’s made face washing faster and more efficient for me and I’m noticing smoother skin. My sister has the more expensive and bigger model that she’s also happy with. You gotta try home cultured veggies, they’re kind of fun and easy and should only take a few days in the warmer summer weather. I can’t wait to reload the jar with red cabbage and cucumbers to ferment. My dog is obsessed with food, she’d eat until she popped if I let her! Thanks so much! It’s a good thing I didn’t put what state I live in, people would be hunting me down! :) I can’t wait to start my shopping spree! 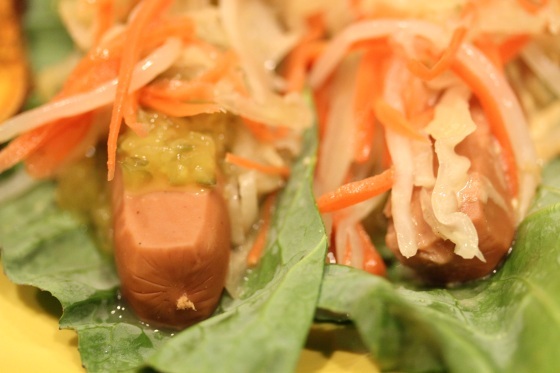 Looks great—definitely the healthiest way you could eat a ‘kraut dog! My dogs love sweet taters, they will beg like crazy for them. And veggie dogs too. They think they are named dogs because they are FOR dogs. I use them for training treats. I love sweet potatoes in any form but baked like fries/chips are best. ;) Yum! A vegan dog and kraut sounds delicious. 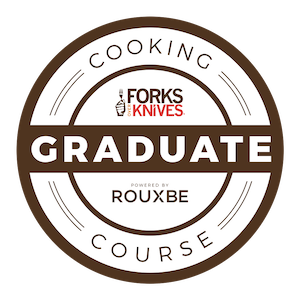 It’s definitely time for fun/summerish dishes like that one! omg your dog would so not like the hello kitty outfit but would look so cute!!! lol!! 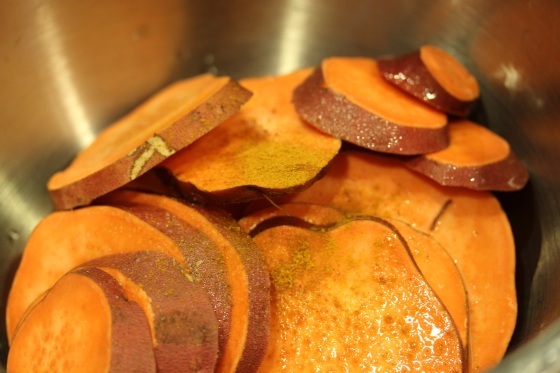 I love that you added curry to the sweet potatoes, that is such a good spice! 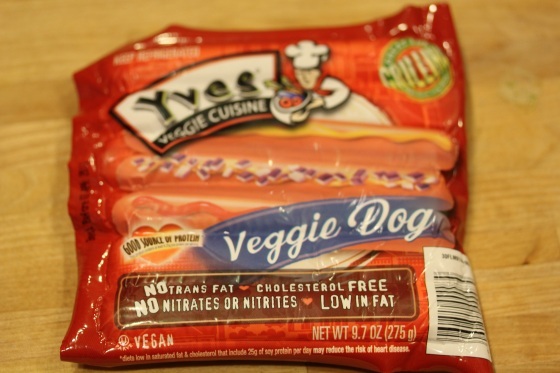 Interesting product review on the veggie dogs – never had them but they sound pretty good! The veggie dogs were surprisingly good, very hearty and flavorful and hard to tell they weren’t meat.